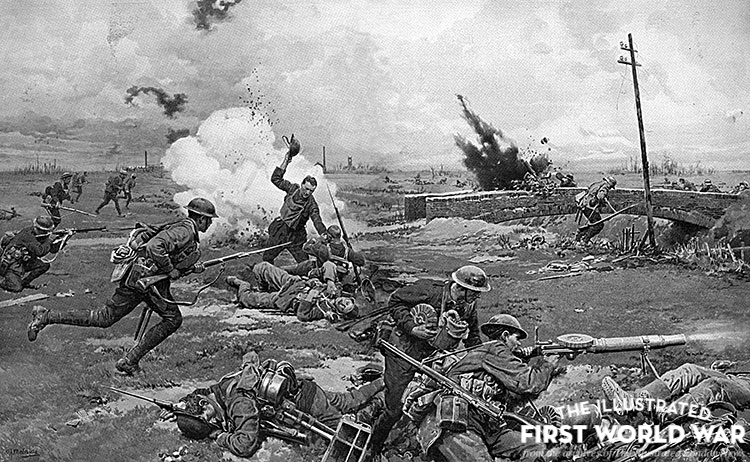 Operation Michael opened the German Spring Offensive in 1918 and attempted to deliver a decisive blow to the Allies, which ultimately ended in failure. In 1917 the United States of America had entered the Great War and brought their resources to the aid of the Allies. However, by the beginning of 1918 American troops had yet to arrive on the Western Front. General Ludendorff decided that if the German Empire was to secure victory, a conclusive offensive was needed before the USA could deploy its troops. Russia had surrendered in November 1917, allowing for 44 divisions to be transferred from the Eastern Front to Belgium and France. This made the “The Great Battle”, as The Illustrated London News described it, possible. Operation Michael was the first and key attack of the German Spring Offensive. It was launched with the strategic purpose of separating the British and French forces by attacking the British Expeditionary Force (BEF) along the Somme. The Illustrated London News reported that on 21 March 1918 the Germans had overrun the British defence along a 55-mile sector and gained 12,000 square miles of territory. The attack cost the British 177,739 casualties, with 75,000 men taken prisoner. However, the Germans had failed to permanently separate the BEF from the French forces. Furthermore, the morale of the German troops was shaken when they discovered that British soldiers were much better supplied with food and even alcohol than they were. Several operations followed over the proceeding months, including Operations Blücher and Yorck. These began on 27 May and pushed the German advance all the way to the River Marne. Paris soon came into artillery range, but fortunately for the Allies logistical and transportation problems prevented the German army from exploiting this strategic opportunity – the French capital was saved. that forced the Germans to retreat all the way to Soissons. Little was reported about Germany’s 1918 victories in the ILN, which naturally focused on Allied gains in the “Great Battle”. The German advance had been spectacularly successful in terms of territorial gain but it had come at an immense cost. More than 800,000 German soldiers were lost and the German army had to hold on to new positions that still had to be fortified. they did so against a feeble and demoralised army that had simply run out of steam. The German Offensive: Flaming Pozières, "One of the Most Awe-Inspire-Inspiring Sights of the War"